Last night my daughter and I made a new rule that all birthdays in our household will now be celebrated in no less than three days. :) This declaration was made because yesterday was my birthday, and my hubby had to be gone the vast majority of the day and evening due to school obligations. When I mentioned last night that I was sad that my birthday was almost over, Shannon came up with the idea of extending my birthday for the rest of the weekend. I like the way that girl thinks! Here is a birthday card that I made for my hubby's cousin, another February birthday. 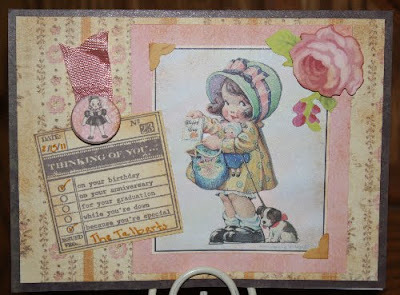 Julie loves anything vintage and girlie, so I thought this image would be perfect for her.